Typed carbon copy letter, signed. W. A. Plecker to Local Registrars, Physicians, Health Officers, Nurses, School Superintendents, and Clerks of the Court, January 1943. This copy was sent to the University of Virginia Hospital. Alumnus Dr. Walker Ashley Plecker, Virginia's first Registrar of Vital Statistics, was determined to classify all Virginians into two categories: White or Colored. The latter category included anyone with one-sixteenth or more African-American, native American, Asian or southern European heritage. 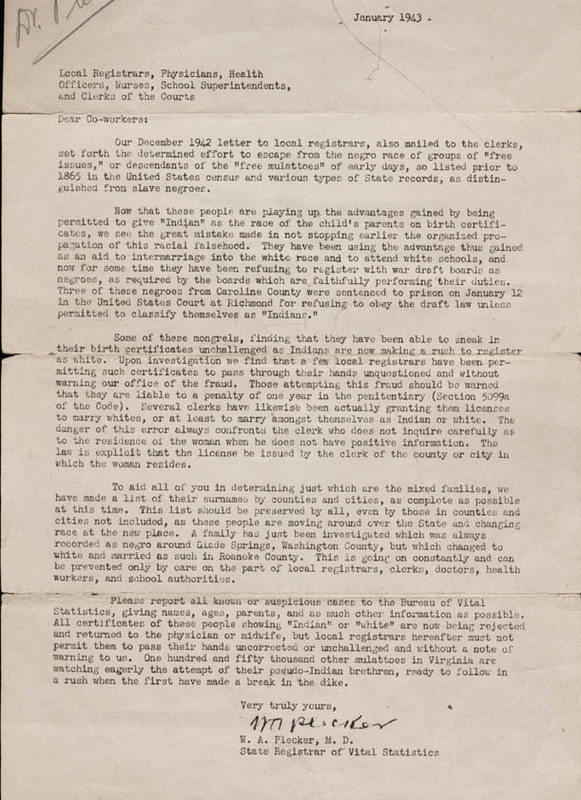 He feared that many racially mixed individuals would masquerade as whites "using the advantage thus gained as an aid to intermarriage into the white race and to attend white schools...." In 1943 he sent a list of surnames, by county, of "mixed Negroid Virginia families striving to pass as 'Indian' or white" and asked local registrars to report any suspicious cases. This blatantly illegal maneuver was ignored by the clerk at the University of Virginia hospital to whom it was sent.